The online version of this article ( https://doi.org/10.1007/s10973-018-7146-6) contains supplementary material, which is available to authorized users. Indole is a well-known and important privileged structure scaffold found in many natural and synthetic compounds. This core is recognized as one of the foremost biologically significant moieties in nature. The indoles are characterized by excellent binding affinity for various receptors [1, 2]. The indole-based compounds can also exhibit various biological activities such as anti-inflammatory, analgesic, antifungal, antimicrobial, insecticidal, antioxidant, antiviral, antidepressant, antiarrhythmic, antihistaminic and antidiabetic ones. [3, 4, 5, 6]. According to the literature, there are over ten thousand biologically active compounds containing indole core. More than 200 of them were approved as commercially available drugs or are undergoing clinical trials [7, 8], e.g., vinblastine (anticancer), indomethacin (anti-inflammatory), arbidol (antiviral), delavirdine (anti-HIV), zafirlukast (anti-asthmatic), pravadoline (analgesic), bucindolol (β-blocker) and roxindole (schizophrenia) [4, 5, 6]. The indoles are also used as dyes, pigments, plastics, fungicides, vitamin supplements, flavour enhancers, and perfumery . The main aim of this research was the thermal and spectroscopic characterization of six indole derivatives, i.e., 5-methoxy-2-(4-methoxyphenyl)-3-methylindole (1), 1-ethyl-5-methoxy-2-(4-methoxyphenyl)-3-methylindole (2), 1-[(4-chlorophenyl)methyl]-5-methoxy-2-(4-methoxyphenyl)-3-methylindole (3), 1-ethyl-2-(4-methoxyphenyl)-3-methylindole (4), 1-ethyl-2-phenyl-5-methoxy-3-methylindole (5) and 11-ethyl-8-methoxy-6,11-dihydro-5H-benzo[a]carbazole (6) (Scheme 1). The investigated compounds were synthesized in the Fisher indolization reaction from the respective arylhydrazine hydrochloride and appropriate ketone in anhydrous boiling ethanol saturated with HCl followed by alkylation with alkyl halide (with application of sodium hydride). These compounds are a non-competitive antagonists of kainate GluK1/GluK2 (GluK—glutamatergic kainate receptors) receptors with low micromolar activity, and compound 2 is the most promising from the series [10, 11]. Non-competitive antagonists of kainate receptors [10, 11, 12, 13, 14, 15] can be considered promising compounds for the treatment of neurodegenerative diseases [16, 17] as well as epilepsy . In particular, a non-competitive mode of action can result in a better safety profile as reported for non-competitive antagonists of α-amino-3-hydroxy-5-methyl-4-isoxazolepropionic acid (AMPA) receptors . In the previous studies, we also constructed 3D models of GluK1 and GluK2 receptors and suggested that indole-derived non-competitive antagonists can bind in the receptor transduction domain [11, 14, 15, 20, 21]. 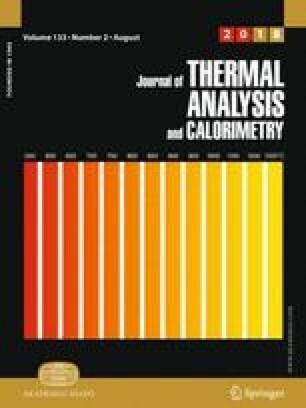 In this study, in order to investigate thermal behaviour of indole derivatives the TG-DSC and TG-FTIR methods were applied. The compounds were also characterized by infrared spectroscopy. In addition, infrared (IR) spectra of the studied indole derivatives were calculated and compared with the experimental data. Theoretical vibrational spectra of the compounds were interpreted in terms of potential energy distribution (PED) analysis. Shortly, in order to describe the vibration of a N-atomic molecule using the PED analysis, the construction of the set of 3N-6 local, linearly independent, internal coordinates is required . This set represents stretching, bending and deformation motions of the functional groups or the chosen fragments of the molecule . The availability of such a coordination set instead of the normal modes causes that the potential energy distribution matrix, the PED matrix, ceases to be diagonal, but the energy distribution originating from the motions of particular functional groups is understandable for the interpreter . The rationale of the performed research results from the necessity of thermal stability of the compounds under investigations which is important for their potential biomedical application. The investigated compounds were synthesized according to the following procedure: the mixture of 0.05 mol of arylhydrazine hydrochloride, 0.05 mol of ketone, 100 cm3 of anhydrous ethanol and 10 cm3 of ethanol saturated with HCl was refluxed for 4 h. The reaction mixture was left overnight at room temperature. The obtained product was filtered and purified by crystallization from ethanol and washed with n-hexane. In the next step, 0.01 mol of the indole derivative was dissolved in 30 cm3 of anhydrous N,N-dimethylformamide (DMF). The reaction mixture was cooled to 0 °C, and 0.8 g of sodium hydride was added (50% oil suspension). After 30 min of mixing, a solution of 0.012 mol of alkyl halide in 20 cm3 of anhydrous DMF was added dropwise. The reaction was allowed to continue at room temperature for 3 h. The mixture was filtered, and 30–40 cm3 of water was added to the filtrate. The obtained precipitate was filtered off and purified by crystallization from ethanol and washed with n-hexane. The detailed physicochemical and spectral properties of the investigated compounds were described in the previous paper . The thermal behaviour of compounds was studied in air and nitrogen atmospheres. The thermal stability and decomposition in oxidizing atmosphere were determined using the Setaram Setsys 16/18 derivatograph. The TG and DSC curves were recorded in temperature range between 30 and 800 °C. The samples (6.18–7.56 mg) were heated in a ceramic crucible at the heating rate of 10 °C min−1 in flowing air (v = 0.75 dm3 h−1). The temperature and heat flow of the instrument were calibrated by the melting point and enthalpy of indium standard. The studies in inert atmosphere were carried out using the TGA Q5000 analyser (TA Instruments, New Castle, Delaware, USA). The compounds (15.14–29.69 mg) were heated in an open platinum crucible from ambient temperature (~ 23–25 °C) to 700 °C in flowing nitrogen (25 cm3 min−1). Simultaneously with the TG analysis in nitrogen, the infrared spectra of gaseous products were recorded using the Nicolet 6700 FTIR spectrophotometer (Thermo Scientific) in the spectral range of 600–4000 cm−1 with a resolution of 4 cm−1 and 6 scans per spectrum. ATR-FTIR spectra were collected using the Thermo Scientific Nicolet 6700 FTIR spectrometer equipped with a Smart iTR diamond ATR accessory in the range from 4000 to 500 cm−1. The samples were placed directly on the diamond crystal of ATR accessory, and the spectra were obtained from 16 scans taken at a resolution of 4 cm−1 and normalized. Energy and geometry of compounds 1–6 were optimized with the B3LYP DFT method (DFT—density functional theory) and the 6-311G++(2df, 2pd) basis set of Gaussian09 software . Gaussian09 was also used to calculate IR spectra. The computed IR spectra were corrected using the scaling factor of 0.962 as recommended for this level of theory . Moreover, the computed vibrational frequencies have been unambiguously assigned by means of the potential energy distribution (PED) analysis of all the fundamental vibration modes by using VEDA 4 program [25, 26] as described previously [27, 28, 29, 30]. The TG-DSC curves providing information about the thermal properties of 1–6 are shown in Fig. 1. As it can be seen in the TG curves, the compounds are characterized by good thermal stability, which is a very important parameter for their potential application as drugs. The first changes are recorded on the DSC curves as endothermic peaks at temperature 100–140 °C. These peaks are not accompanied by a mass loss and can be attributed to the melting process. They are roughly similar to the values reported earlier and determined using a Boetius apparatus . The melting point onset temperature (Tonset), peak temperature (Tpeak) corresponding to each peak, and enthalpy of fusion taken from the DSC curves for all compounds are listed in Table 1. The melting peaks are sharp which indicates that the compounds were probably synthesised as pure, crystalline substances [31, 32, 33]. Generally, the substitution of the pyrrole hydrogen atom in position 1 leads to a decreased melting point. The exception is compound 4 where the melting point is comparable to that of compound 1. This can be a result of a lack of a substituent in the 5-position of the indole core. The decompositions of the compounds in air are two- or three-step processes that are noted on the TG curves (see Fig. 1). For all compounds, the major mass loss (56.98–95.93%) occurs in the first stage which starts at 183–251 °C (Table 2). Taking into account the initial temperature of the decomposition processes, the following relative thermal stability order: 5 = 4 < 2 < 6 < 1 < 3 can be established. As can be observed, the substitution of hydrogen attached to nitrogen atom with the ethyl group decreases the combustion temperature of compounds while the p-chlorobenzyl substituent stabilizes the molecule and increases the decomposition temperature of 3 in air compared to 1. In the case of compounds 1 and 3, probably during the first stage the substituents of the indole core are broken off and combusted. The theoretical values of the indole residue (C8H7N) are 43.82 and 29.95% while the experimental ones are equal to 43.03 and 29.60% for compounds 1 and 3, respectively. The formed products are unstable and immediately undergo complete destruction and combustion accompanied by a significant exothermic effect. The samples are fully decomposed at 612–652 °C. It is worth mentioning that for compound 1 on the DTG curve two maxima are visible during this stage, but this is not clearly indicated on the TG curve. The remaining compounds are almost completely decomposed during this step (more than 85% of overall mass is lost), and the formed residues are combusted during one (5 and 6) or two (2 and 4) steps. Compounds 4, 5 and 6 are fully combusted at a temperature of 570–603 °C. In the case of 2, it was found that under the measuring conditions a small amount of unburnt organic matrix remains (1.49%). Thermal behaviour of 1–6 was also studied in nitrogen atmosphere (see Fig. 2). The order of thermal stabilities in inert and oxidizing atmospheres is similar; taking into account the initial temperature of the decomposition processes under nitrogen stream, the following relative thermal stability order: 5 ≈ 4 < 2 < 6 < 1 < 3 can be established. In contrast to the thermal decomposition in air, the pyrolysis processes start at a lower temperature (about 12–22 °C) than the combustion ones. Thermal decompositions of compounds in nitrogen proceed in one major mass loss step and similar to the combustion, the compounds are almost completely burnt (for compound 2 the residue after the pyrolysis is 1.54%). The total pyrolysis of the compounds can be associated with the presence of methoxy groups as observed for other compounds containing such substituent [30, 31]. Simultaneously with the TG analysis in nitrogen, the FTIR spectra of gaseous products were recorded. The FTIR spectra of gaseous products evolved during the decomposition of compounds 1 and 3 are given in Fig. 3. In the spectra of gaseous products, except for the compound 3, only the bands characteristic of water, carbon monoxide and carbon dioxide were present. The peaks at 2240–2400 cm−1 are assigned to stretching vibration ν(C–O) of carbon dioxide molecule. In addition, a band at 669 cm−1 is observed due to the deformation vibration of CO2. The double peaks in the range 2050–2275 cm−1 correspond to the vibrations of CO molecule. The characteristic bands of water molecules are observed in the range 3450–4000 and 1300–1950 cm−1 for stretching and deformation vibrations, respectively [31, 32, 34]. Probably other compounds such as indole can be condensed in the transfer line and do not reach the detector. In the case of compound 3, at a temperature between 340 and 420 °C of the pyrolysis process on the FTIR spectra of evolved gases, several bands in the range 2700–3100 and 750–1800 cm−1 were recorded. These peaks are probably due to the presence of anisole, p-chlorotoluene and chlorobenzene (see Fig. 4). The FTIR spectra of 1–6 are given in Figs. S1–S6. The observed and calculated frequencies in the infrared spectra of studied compounds together with their PED assignment of signals are presented in Tables 3 and S1–S5 (Supplementary material). The scaled computed IR spectra are in accordance with the experimental values. The strong, sharp peak at 3379 cm−1 in the FTIR spectrum of 1 is characteristic of ν(N–H) vibrations of the pyrrole ring. This is consistent with the literature data; the indoles unsubstituted in the l-position (N) give a sharp absorption peak in the range 3500–3300 cm−1 [35, 36, 37, 38, 39, 40]. This band was not recorded in the spectra of other studied compounds due to the substitution of hydrogen atom in position 1 by ethyl or 4-chlorobenzyl group. The peaks at 3100–2990 cm−1 can be assigned to the C–H stretching vibrations of the aromatic bonds. The symmetric and asymmetric C–H stretching bands of the methyl/ethyl groups are observed in 2990–2800 cm−1. The other important peaks are observed at the range 1620–1400 cm−1, and they are mainly due to the stretching vibrations ν(CC) of indole and benzene rings. The varying intensity bands observed in the FTIR spectra at 1373–1342 and 1287–1283 cm−1 can be assigned to the C–N stretching modes of pyrrolic ring. These assignments are in agreement with the literature [35, 39, 41] and correlate with the theoretical calculations. The remaining bands characteristic of 1–6 with their detailed description is given in Tables 3 and S1–S5. Thermal analysis of six indoles derivatives was performed. The investigated compounds are stable at room temperature which is important for their medical application. The DSC melting peaks of compounds are sharp indicating that they are probably crystalline, pure substances. In air atmosphere, the decomposition process of 1–6 occurs in two or three stages where the main mass loss occurs during the first one. On the basis of the TG-DSC analysis, it can be concluded that the substitution of hydrogen atom by the ethyl group on the pyrrole ring in 1 position leads to decrease in the thermal stability of the studied indoles. Changing the substituent to the p-chlorobenzyl group causes the compound stabilization and, consequently, an increase in the decomposition temperature of 3 compared to that of the other compounds. The performed TG-FTIR analysis showed there are no residual solvents in the structure of studied compounds. The paper was developed using the equipment purchased within the projects “The equipment of innovative laboratories doing research on new medicines used in the therapy of civilization and neoplastic diseases” and “Enhancement of the Research and Development Potential of the UMCS Faculty of Chemistry and the Faculty of Biology and Earth Sciences” within the Operational Program Development of Eastern Poland 2007–2013, Priority Axis I Modern Economy, operations I.3 Innovation promotion. Calculations with Gaussian 09 were performed under a computational grant by Interdisciplinary Center for Mathematical and Computational Modeling (ICM), Warsaw, Poland, grant number G30-18 and under resources and licenses by CSC, Finland.